Like the RoadHawk Vision, the BlackVue DR650S takes the form of a tube with a forward-facing lens at one end and an adhesive mount at the other, although the BlackVue is somewhat larger than the RoadHawk unit. Unlike the RoadHawk, though, the BlackVue boasts the full complement of sensors, including a GPS receiver and a three-axis G-sensor. However, its CMOS sensor can only record video at either 1080p or 720p in either 15 or 30fps. Inside the Apple-esque box you’ll find a generous length power cable terminating in a cigarette lighter adaptor, five cable clips, a trim pry tool, spare adhesive pad, a 16GB MicroSD card, and a useful MicroSD to USB card reader. The included manual provides clear instructions on how to set up the camera in your vehicle, while the rotating mount makes it easy to achieve the desired field of view. It’s a shame, though, that the DR650S uses a non-standard power port, as this not only means there’s no USB port for connection to a PC for footage download or set-up, but also prevents you from using a USB port for power should your vehicle provide one. Where the BlackVue makes up it, however, is in its spread of functionality. The DR650S provides easily the best parking mode of all the units tested, although you’ll need either a hard-wired power connection or an optional battery pack to use it. With that in place, the DR650S constantly buffers video into its memory while the vehicle is stationary and, should it detect movement within the frame, it will record one, two or three minutes of video to a separate file depending on your settings. The sensitivity of the motion detection can be configured so as to filter out foliage moving in the wind, for example, while the G-sensor sensitivity for both parking and incident recording can be altered independently and along three axes of movement. 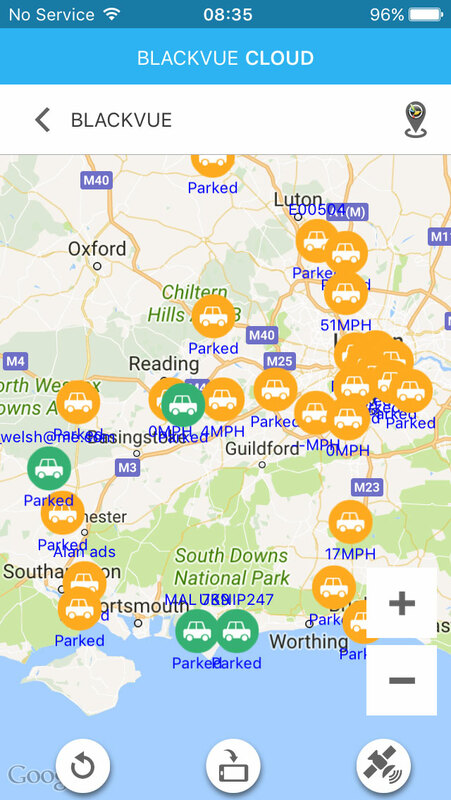 You can even set a speed alert which, when breached, triggers an event recording – useful perhaps when leaving your car at a garage for servicing to prevent joy-riding! Perhaps the most interesting feature is BlackVue’s Cloud functionality. By pairing the camera with up to three Wifi hotspots (perhaps your home broadband, your mobile, and your car if it has embedded Wifi) you can be notified via your smartphone when something happens to your car, watch the live video feed, backup recorded footage, track your car’s location in real-time, and even initiate voice chat. 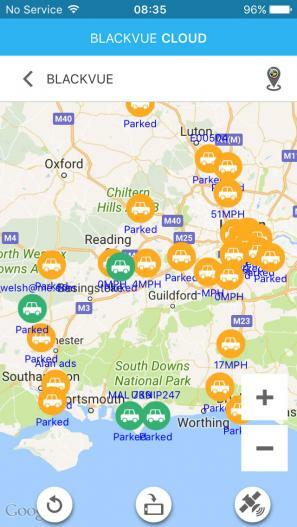 You can even allow others to watch your live feed as you drive around the country – although that sounds like extreme voyeurism to us – but it’s a touch annoying that the map of available units always defaults to the US, forcing you to pan across to the UK each time. Some functionality we could see could be particularly useful to businesses, especially those managing a fleet, and that’s perhaps why some features are limited: you can only register one camera per account, watch 10 minutes of live feed per day, and upload footage within strict limits – anything above this requires a paid upgrade. 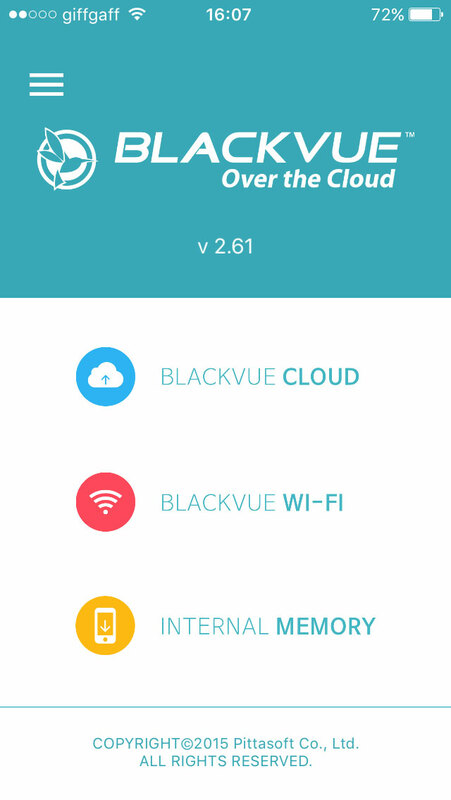 However, cloud functionality won’t be for everyone given the obvious privacy implications, so BlackVue provide the ability to turn it off completely. For those that do use it, however, we would remind you to change the default Wifi password, remove the pairing QR code sticker from the unit, and strongly advise against naming your cloud account after your car, as we noticed several people had. 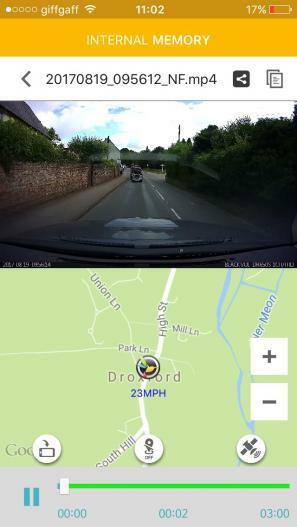 As a regular dashcam, the DR650S records its footage in files of one to three minutes in length, allows date, time and speed captioning (although not GPS co-ordinates), and issues voice prompts in response to various conditions – starting recording, parking impact detected, etc. Footage is distinguished as either Normal, Event or Parking, and can be accessed by plugging the SD card directly into a PC, using the well-designed smartphone app (iOS, Android and in limited form, Windows Phone/Mobile), or by using BlackVue’s Viewer application for both PC and Mac. 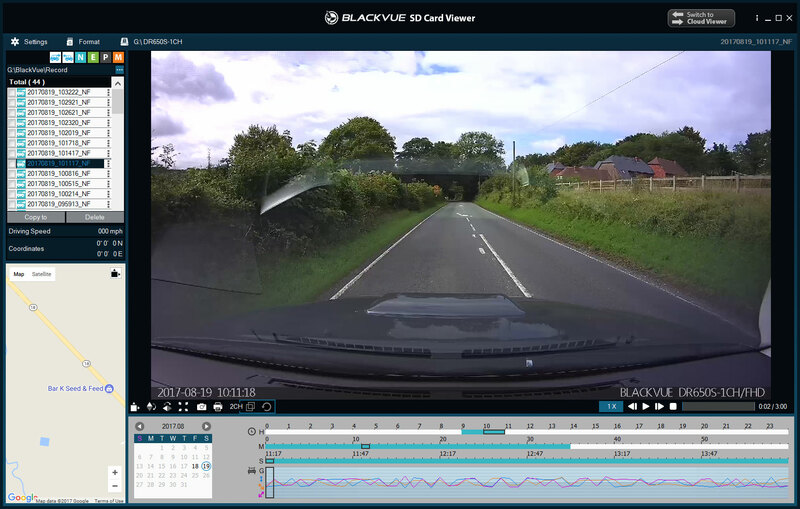 The latter automatically detects when a BlackVue SD card is inserted, and footage is arranged around a handy timeline that makes it easy to find a particular scene. Unfortunately, however, the software failed to interpret the GPS data recorded by our camera, so neither the speed readout nor rolling Google Maps display functioned correctly. The PC application also incorporates a Cloud Viewer function that allows you to remotely watch your camera’s live feed, although frustratingly its use automatically logs you out of the smartphone app as BlackVue permits only one active log-in at a time. Given its use of a Sony Exmor sensor, we had high hopes for the DR650’s image quality. The result is a very contrasty image where shadow areas tended towards black, while lighter subjects were often over-exposed. Transitions from darker, tree-lined roads to more open sections were rather poorly handled, although its aggressive approach to contrast and sharpening did mean that number plates and road signs were far more legible than they were with any of the other cameras we tested. Its night performance, I’m afraid, we would have to rate as poor. Objects not directly illuminated by headlights are lost to the blackness of the night, rendering anything outside a small section in the centre of the frame as good as invisible. 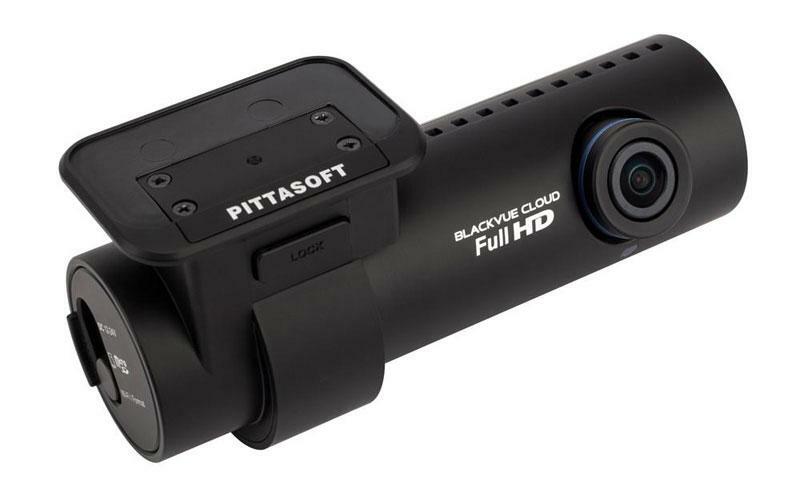 Whether BlackVue’s Cloud functionality appeals to you is perhaps a subjective matter, but with a hard-wired power connection the DR650S offered the greatest level of protection thanks to its motion detection-driven parking mode. It’s also available in a two-channel configuration with a separate rear-facing camera.